In this test of highly compressible WAV files, we can see the power of the multimedia compression algorithms used in the newer compressors. The relatively unknown WinRK takes the top place by compressing the fileset to just over 109MB. That translates into an incredible reduction in size of over 45%. Its two closest contenders are the relatively unknown Squeez and SBC Archiver. Both managed a size reduction of almost 44%. Current favourites like WinRAR and WinZip didn't do so well in this test. Both only managed to reduce the fileset size by about 10%. 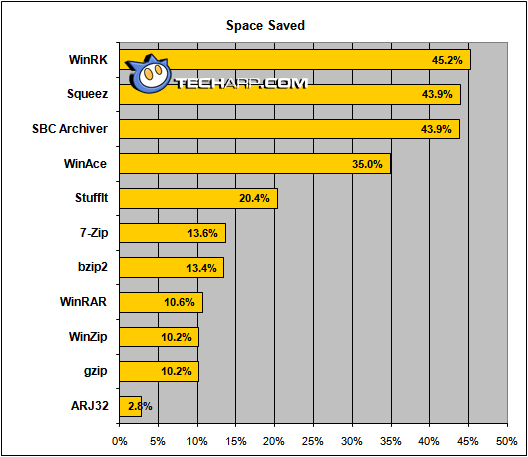 WinAce did better at 35%, but that was still far poorer than WinRK, Squeez or SBC Archiver. When it comes to compression speed, however, things were quite different. Although WinRK managed to create the smallest archive, it did so at an enormous cost in time. Even at its fastest setting, it took over 2.5 minutes to compress the fileset. The speed leader was ARJ32. It crunched through 200MB of WAV files in just 5.68 seconds! Amazing, isn't it? That's over 35MB/s. gzip, the favourite of Linux users, as well as WinZip and WinRAR did quite well, although they were far from posing a credible challenge to ARJ32. They averaged a compression speed of about 14MB/s. The compression efficiency rating is a simple way to evaluate the efficiency of each data compressor. This way, we can see which compressor can save the most space in the least time. Please note that a higher efficiency rating does not mean the compressor is better. It just means the compressor has a better compression-to-speed ratio. A more efficient compressor is, of course, always more desirable than a less efficient one. 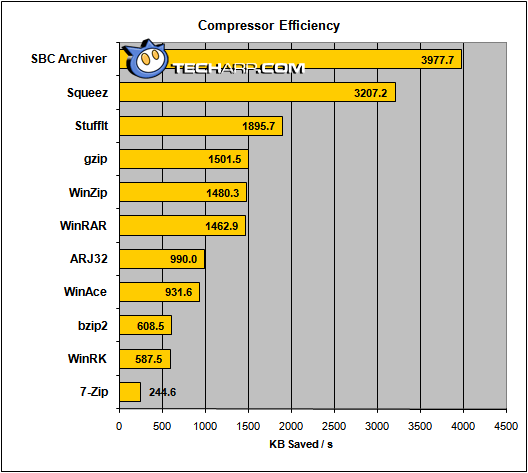 The most efficient data compressors when it came to WAV files was SBC Archiver, followed by Squeez. Their moderately fast speed combined with their excellent compression rate allowed them to become the undisputed efficiency champions. They were actually about twice as efficient as their nearest competitor, StuffIt! 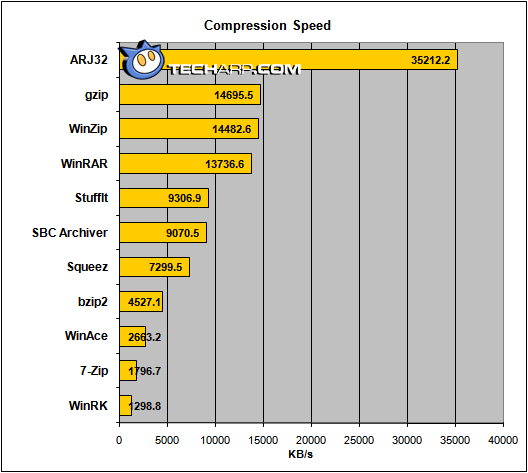 The WAV compression king, WinRK, ended up as the second-most inefficient compressor in this comparison due entirely to its slow performance. The long time it took to compress the fileset completely offset the amount of space saved. The most inefficient compressor of WAV files was 7-Zip. Its slow compression speed, second only to WinRK, coupled with its mediocre compression, made it worse than WinRK which at least had its excellent compression ratio to make up for its speed.